The number of US patents that cite Wikipedia increased again in 2010. Approximately 1,461 patents issued last year contain one or more references to Wikipedia articles, 81 percent more than in 2009. Although this is a tiny fraction of the total number of patents issued (roughly half a percent), it is still an impressive increase. In fact, because of variations in how Wikipedia articles are cited in patents (for example, in the specification rather than the list of references) the actual number may be higher. Wikipedia was first cited in a US patent in 2003. In 2006, the USPTO banned patent examiners from citing Wikipedia articles as prior art. The top ten assignees shown in Table 1 hold nearly 23 percent of patents that cite Wikipedia. Technology firms dominate the list, which suggests that computer-related patents are more likely to cite Wikipedia than patents related to other technologies. Indeed, the top three assignees, Microsoft, IBM and Apple, account for almost 12 percent of the total. Three of the top ten, Intel, Infineon and Micron, are manufacturers of semiconductors and other computer hardware. 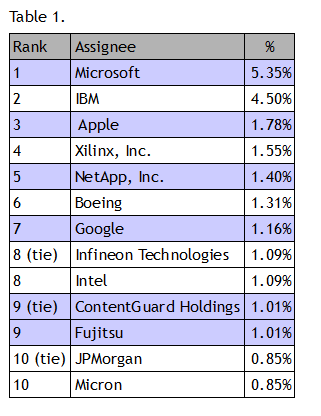 Two of the top ten assignees, Boeing and JPMorgan, are not directly involved computer-related technologies. Only 5 percent of patents that cite Wikipedia are unassigned. Table 2 shows the top ten primary patent classes assigned to patents that cite Wikipedia. The majority of the classes relate to information and communication technologies (ICT). 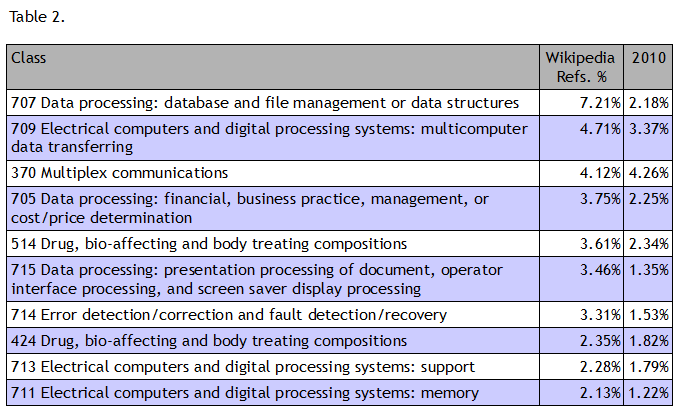 Only two classes in the top ten, 514 and 424, cover technologies (drugs and pharmaceuticals) not related to ICT. As the data shows, the percentage of patents in each class that cite Wikipedia exceeds the percentage of all patents issued in 2010. For example, Class 707 accounts for 7.21% of patents that cite Wikipedia articles but only 2.18% of all patents issued in 2010. This is true for all classes with the exception of Class 370.